RMPrepUSB, Easy2Boot and USB booting: 'INACCESSIBLE BOOT DEVICE' error from Windows 10 - and you won't believe the cause (I didn't)! 'INACCESSIBLE BOOT DEVICE' error from Windows 10 - and you won't believe the cause (I didn't)! In the last few weeks, my Asus Z87 Haswell PC has started to display the dreaded 'Inaccessible boot device' BSOD error on start-up (it was the more friendly Windows 10 graphical version with QR code). Now the PC was actually starting to boot. I would get the spinning circle of white dots and I could see the HDD LED blinking. Then the HDD LED would stop flashing, and after displaying 30 seconds or so of more spinning dots, I would get this blue screen error. The thing was, if I rebooted the PC a few times, it did eventually manage to boot, so I continued to use the PC for a few weeks and just put up with this issue. I tried the Windows Troubleshooter and the Repair option and also ran BCDBoot manually, but it didn't fix it. A few days ago, I fitted a new 2TB Hitachi SATA HDD drive to my system for extra storage, so I decided to investigate this issue further (also I was now getting the BSOD error more often!). Since I had just connected a new SATA HDD, the first thing I did was to disconnect it, but I kept getting the same BSOD. Next I disconnected all the SATA HDDs (2) and the single SATA DVD drive, I just left the first Samsung 500GB SATA SSD boot drive connected. The result was a perfect boot into Windows 10. I tested this several times, switching the system off and on again - all perfect! So, the problem was due to one of the SATA drives that I had disconnected. I re-connected them back one-by-one until the problem re-appeared. And you'll never believe the cause! It was the empty SATA R/RW DVD drive (an LGE-DMGSA-H71L(B) made in October 2007 by Hitachi-LG Data Storage Inc.). It came out of my old Dell Inspiron 530 when I built the Z87 PC a few years ago and up until a few weeks ago had been working just fine (that is, AFAIK - I hardly ever use it now - it's a bit like a VHS Video Recorder or my appendix - vestigial!). I couldn't believe it! How could an empty DVD drive cause Windows to throw up an 'Inaccessible Boot Device' error! I swapped over the DVD R/RW drive with an old DVD ROM drive (GDR-H20N LGE-DMGDR-H20V(B)) which I pulled out of the old Dell Inspiron 530 PC - and now my Z87 PC booted just fine! I swapped back the original suspect DVD R/RW drive and got the same BSOD screen again. I repeated this swap exercise twice and the BSOD fault always occurred when the DVD R/RW was connected. I also changed the power cable and SATA cable, but still got the same results. Even with just the Samsung SSD HDD + DVD R/RW drive and no other SATA drives connected, I got the same BSOD. So I fitted the old DVD ROM drive and all my SATA HDDs and put back the PC cover and used the PC for several days without problems. I ordered a replacement DVD R/RW drive and it came today. 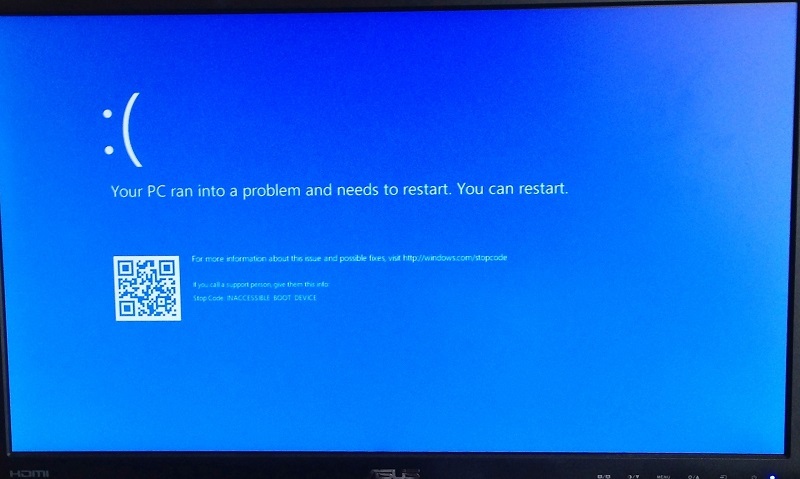 To start with, I put back the 'faulty' DVD R/RW drive and sure enough, I got the same BSOD (see picture!). I then fitted the new DVD R/RW drive and the PC booted without a problem! So there we have it - proof! If you get an 'Inaccessible boot device' error from Windows, it may be due to an empty DVD drive! P.S. I also upgraded to the new Anniversary version of Windows 10 before the new DVD R/RW drive arrived, and that did not fix anything. P.S. If you found this useful, please tick one of the Reactions boxes below.